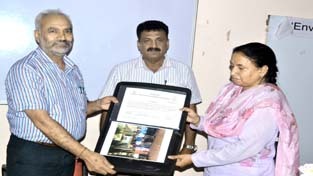 JU VC Prof R D Sharma presenting certificate during valedictory function of training programme on Friday. Jammu,Aug 7: Valedictory function of NNRMS training programme on geospatial technologies for Capacity Building for PGT teachers in Geography of Kendriya Vidyalaya (KV), Navodaya Vidyalaya (NV) and Central Board of Secondary Education (CBSE) of higher secondary level was held in the department of Remote Sensing & GIS, University. Vice Chancellor Prof R D. Sharma was the chief guest of the occasion and he distributed certificate among the participants. He lauded the efforts of the department for organizing 10 day Training programme held from July 27 to August 7, 2015 and sponsored by Indian Space Research Organization (ISRO), Department of Space, Govt. of India in Collaboration with National Council of Educational Research and Training (NCERT), New Delhi. Prof Sharma further said that the participants will act as an ambassadors and share with the other agencies the kind of activities University is organizing in this sphere which shall motivate them also to do activities of similar nature in the University. Prof A.S. Jasrotia, briefed about the programme and said that during these 10 day training programme, lectures were delivered by the faculty members of the department of Remote Sensing & GIS and the resources persons from Department of Geography Himachal Pradesh University Shimla (Prof B. S Marh) and Prbhakar Alok Verma Scientist, Indian Institute of Remote Sensing, Dehradun ISRO on different topics. Prof Jasrotia also said that aim of this training programme was to ultimately implement the geospatial technology (Remote Sensing, GIS and GPS) at schools level. Among others Prof. Manoj K Dhar Director School of Biotechnology, Prof V D Singh Director, Distance Education, Prof G M Bhat Rector Bhaderwah Campus, Prof. Prakash Anthal Director Patnitop campus, Jai Kumar Sharma Director College Development Council, Prof Anil K Raina, Head, Department of Environmental Sciences, Prof R K Ganjoo Head Department of Geology, Prof. M.A. Malik, Prof. Jasbir Singh Provost Hostel Jammu University, Prof Rampal Department of Environmental Sciences, Dr Anuradha Head Department of Geography, Dr. Varun Parmar, Dr S. N Kundal, Dr Varender Kundal, Dr Devinder Singh, participants, Scholars and Students of the University of Jammu were also present on the occasion.